[Featured image for ALDUB Pagbangon from @TalkNText.] Before anything else, Boss Joey de Leon greeted Bossing Vic Sotto. “Pare, alam mo naman. Wala akong maibibigay sa yo pag Pasko kundi I love you, pare.” (Dude, you already knew. I don’t have anything to give you this Christmas but I love you, dude.) He then proceeded to hug his pal of more than 4 decades. A friendship that spanned more years that the 36-year legacy that is Eat Bulaga. 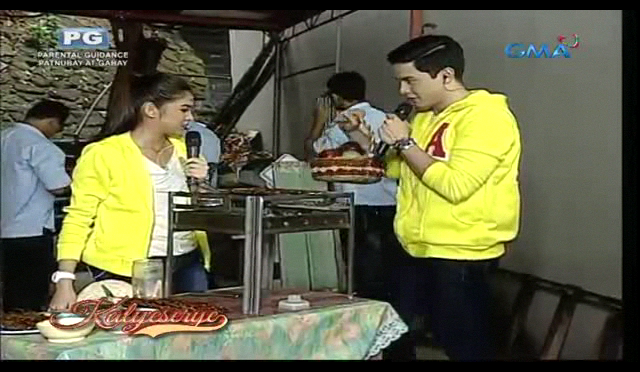 The ALDUB Pagbangon episode officially opens with Divina tending to her “isaw” (grilled chicken intestines) stall. She was DUBsmashing to Mariah Carey’s “My All” while fanning the grill. The Kalye’s Angels – Donya Tidora, Lola Nidora and Donya Tinidora are nowhere around. But the Rogelio Rogelio Rogelio are present. So she’s left to attract customers on her own. The KalyeSerye commentators can tell how hardup the House of De Explorer entourage had gotten. “Bili naman kayo o. Sige na.” (Buy now. Please.) Sometimes the Rogelio would try attracting some interested buyers. But Divina put a price tag too steep for the customers to consider buying. It was revealed when Bossing Vic asked her. Divina replied. “Sampu po. Sampung libo.” (It’s ten. Ten thousand.) Bossing Vic understood Divina’s problem at the ALDUB Pagbangon episode. “Kaya naman pala walang bumibili eh.” (No wonder no one is buying.) While tending to the sticks of “isaw” and to passersby she’s trying to convince, the phone rang. She unlocked the phone using some air behind her. It made Allan K ask her to unlock her phone again just to be sure he saw the password right. It was Lola Nidora on the phone. Divina just repeated her instructions on the phone for the audience watching the ALDUB Pagbangon episode to hear. “Hello, Lola. Asan na po kayo? Ay, ganun po ba? Sige po. Sige po. Ikumusta nyo na lang po ako diyan. Wag po kayong mag-alala. Kasama ko naman po yung mga Rogelio saka si Rihanna. Saka si Dora. Ingat po kayo diyan sa Dipolog ha?” (Hello, granny. Where are you? Oh, is that so? Okay. Okay. Please send my regards. Don’t worry. I am with the Rogelio and Rihanna. And Dora. Be safe always in Dipolog okay?) The Rogelio Rogelio Rogelio were shown wearing blue barongs that had seen better days. On why they stayed despite the uncertainty of another payday? It must have been loyalty. Divina agreed with Lola Nidora on the phone regarding the possible help to be solicited. “Naku, oo nga po eh. Sana po matulungan nila tayo.” (Yes indeed. I hope they get to help us.) After talking to Lola Nidora, Divina pitched her “isaw” sticks to Bossing Vic. “Bossing, bili ka na po.” (Bossing, please buy.) It was more of a plea than a pitch at the ALDUB Pagbangon episode though. Divina asked the Rogelio Rogelio Rogelio in selling the sticks of “isaw”. Shortly after Tenten left, Alden appeared on the spot. “May naiwan si Mama Ten.” (Mama Ten left something.) He then showed a fruit basket for Divina to eat. Alden and Divina then had a DUBsmash exchange to enjoy as well. Alden rubbed off the charcoal stain from Divina’s forehead with his thumb. The soot from the barbecue grill almost ruined Divina’s makeup. She finally had time at the ALDUB Pagbangon episode to eat a fruit with Alden. Alden bit the part of the apple that Divina bit. Divina liked Alden’s jacket. “Uy! Pareho tayo ng jacket ha?” (Hey! We have the same jacket, huh?) Alden knew that Divina is referring to the jacket he gave at the ALDUB 21st Weeksary too. “Buti naman sinuot mo.” (Good thing you wore it.) He then realized that Divina is alone. “Nasan sina lola?” (Where are the grannies?) Divina mentioned that they are in Dipolog. Alden found himself in luck. “Buti na lang sakto yung punta ko rito. Buti na lang malapit yung barangay. Divina was thankful for the company at the ALDUB Pagbangon episode. Bossing Vic saw a single white female behind them. “Ayan! May customer!” (Here! A customer!) Allan K found her familiar. “Si Cindy na naman yan?” (Is that Cindy again?) It was Cindy. Divina herself confirmed it. At first she tried to buy some “isaw” with her broken Tagalog. Alden was quick to ask Cindy. “Why are you here?” Divina picked a stick for Cindy. “Eto oh. Yung hilaw pa.” (Here. Have a half-cooked one.) Cindy then recognized Alden and greeted him. It scared the sh*t out of Alden at the ALDUB Pagbangon episode. “No! Bad ka! Bad ka!” (You’re bad! You’re bad!) Alden ended up sounding a little like little Baste in avoiding Cindy. Divina tried to appease Alden in the same way as little Baste. “Be nice. Be nice.” Divina’s frown was a little obvious. Alden was visibly scared. It reminded him of the time when Cindy almost literally threw him at the ALDUB 18th Weeksary episode. “Yaya, hello.” Divina tried to be civil towards Cindy at the ALDUB Pagbangon episode. “Nice to see you again.” Seems like she has recovered from her amnesia from the ALDUB Stay Strong episode. No Frankie in tow though. But her accent is still evident at the ALDUB Pagbangon episode. Cindy then hugged Alden. Alden is too scared to respond to the hug. In broken Tagalog, Cindy tried to talk to Alden and Divina. “Ano ginagawa nyo dito?” (What are you doing here?) Her Tagalog was so broken. Boss Joey openly doubted Cindy’s recovery as of the ALDUB Pagbangon episode. Alden then obeyed Divina and tried to be nice to Cindy. “Actually, Cindy. Long time no see. How are you?” When asked how is she doing so far. Cindy replied. “I’m okay now. Just temporary amnesia.” No details how she got her memory back though. Cindy then revealed her falling out with Donya Babah. “Do you know Lola Babah got mad of me? And she doesn’t talk with me anymore.” Alden himself hasn’t talked to Donya Babah for quite some time. “Hindi nga nagpakita si Lola. Nasa farm pa.” (She hasn’t even showed herself. She’s still at the farm.) Bossing Vic had to rephrase some of the things that Cindy said to make sure that he heard her right at the ALDUB Pagbangon episode. Bossing Vic also verified if Donya Babah is now at the farm. Alden reiterated what he said earlier. “Busy po sa pagfa-farm, Bossing. Hanggang ngayon, di pa rin po ako kinakausap.” (She’s busy at the farm. Until now, she still hasn’t talked to me.) Bossing had heard enough and let Cindy talk. And talk Cindy did. In Russian. She loves her language so much. She didn’t mind if the people around her didn’t understand a thing. Divina then unleashed some gibberish that sounded like Chinese. Alden had to ask Divina. “Ano sabi?” (What did she say?) Divina then admitted. “Hindi ko rin alam eh.” (I don’t know either.) Cindy then said goodbye. Divina and Alden bid her goodbye as well at the ALDUB Pagbangon episode. Divina liked how Cindy explained herself. “Mabait naman itong si Cindy eh.” (Cindy is nice after all.) Alden considered the amnesia as a blessing in disguise. “Buti na lang nagka-amnesia.” (Good thing she got amnesia.) Divina found that thought rude. Even to someone like Cindy. Alden explained. “Eh kasi kundi siya nagka-amnesia, natuloy ang kasal. Wala ako sa tabi mo ngayon.” (If she didn’t get amnesia, the wedding pushed through. I won’t be beside you now.) It’s the part in the ALDUB Pagbangon episode that Divina agreed with. Alden then asked for a kiss. Only for Divina to thwart that attempt again. So he had to settle for a DUBsmash exchange. For now. Divina insisted that it’s nothing. “Alden, wag na nga nating pag-usapan. Ikaw naman eh. Inuubos mo yung tinda ko! Pambaon ko yan bukas! Respeto naman, Alden!” (Let’s not talk about it. Please. You’re consuming my goods! That’s for my allowance tomorrow! Show some respect!) Alden had several sticks eaten in front of the camera. Alden had to repeat himself before Divina gets distracted again. “Ano ba nakasulat dun? Personal ba? Personal ba? Gusto mo bang mag-audition ulit? Gusto mo bang mag-host ng pababa ulit?” (What is written there? Is it personal? Is it personal? You want another audition? 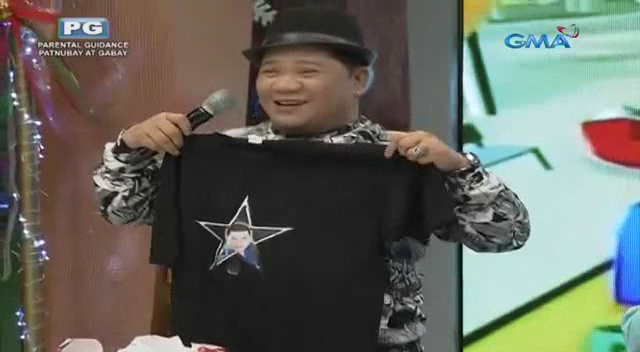 You want another “pababa” hosting stint again?) Divina isn’t talking. But she nudged Alden with her foot. Alden blew Divina’s cover to Bossing Vic. “Sumisipa sa ilalim, Bossing.” (She’s kicking me underneath.) Bossing Vic then asked if there are any jokes at the ALDUB Pagbangon episode. Alden relayed the question to Divina. Divina shot the question back to Alden. “Ikaw? May joke ka ba?” (You? Got a joke?) Alden sensed Divina’s irritation. “Ba’t galit ka? Nagtatanong lang naman eh.” (Why so mad? I’m just asking.) Divina admitted getting irritated. “Ang kulit mo eh. Sinabi nang wag pag-usapan. Kinukulit mo pa ako eh.” (You’re so persistent. I already said not to talk about it. And you’re messing with me.) Alden begged. “Mag-usap tayo.” (Let’s talk it over.) Divina said no. Alden kept begging at the ALDUB Pagbagon episode. “Sabihin mo na, please. Ano bang laman nung sulat? Mapagkakatiwalaan mo naman ako. Di ba nga? BFF mo ko?” (Please tell me. What are the contents of the letter? You can trust me. Isn’t it? I’m your BFF?) Allan K interpreted BFF though. “Boyfriend forever?” Alden happily snapped at Allan K. “Huy!” Even if Alden’s tone got chirpy with Allan K’s remark. Divina is still in her sullen self. Divina left instructions first to the Rogelio Rogelio Rogelio before going with Alden to the chosen winner’s house. “Kayo po muna magbantay niyan. Salamat po. Dapat po pagbalik ko, ubos na yung benta ha?” (Please watch over this for the meantime. Thank you. All of them should be gone by the time I get back, okay?) Alden reached for his umbrella to assist Divina on their way out. The rains hasn’t stopped as of the ALDUB Pagbangon episode. Also, Alden had to be extra alert in protecting Divina [Maine] from random erratic fans. Like the fans who slipped through security to kiss Maine. Alden knew very little about Dodong. So he had to ask. “Wala ba siyang address? Wala ka bang number niya?” (Hasn’t he got any address? Or number maybe?) Divina found none in the letter sent in the ALDUB Bagong Simula episode. “Wala eh. Mansion lang yung alam niya.” (No. The only address he knew is the mansion.) Alden made a plan for the meantime at the ALDUB Pagbangon episode. “Sige. Ganito na lang. Gagawa tayo ng paraan. Ang mahalaga, alam nating buhay ang tatay mo.” (Okay. Let’s do it this way. We’d make a way. What’s important is we both know that your father is alive.) Divina made Alden promise again. “Basta promise mo. Wag mo muna itong sasabihin kay lola ha?” (Promise me. Don’t tell granny this for now okay?) The truck horn honked off, signaling the end of the ALDUB Pagbangon episode. What plan is Alden out to prepare for Divina? How long would the grannies be kept out of the dark? Tune in to Eat Bulaga. Monday to Saturday at noontime. Like Eat Bulaga’s official Facebook page to catch the ALDUB Pagbangon episode replay. With Donya Tinidora not around, no Gasgas will read his spiel. Allan K believed that Maine Mendoza can do it. But she just DUBsmashed the spiel. Alden read Gasgas’ spiel. Aldenn and Maine ended up sharing the spotlight because of this. What lies ahead with Divina finally searching her remaining parent? More episode recaps here at The Philippines Web. Liking us on Facebook and following us on Twitter would keep you abreast of the latest episode recaps. We’d be expecting you.